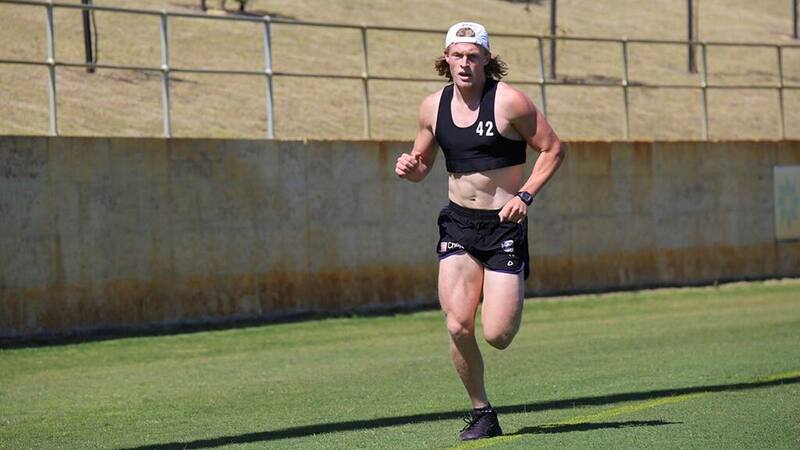 KEY FREMANTLE youngsters Griffin Logue and Connor Blakely have given a strong indication that last season's injury woes are behind them after finishing fourth and sixth respectively in the Dockers' first pre-season time trial. There were few surprises as rookie Stefan Giro took out the 2km dash, held between the club's first-to-fourth-year players. Andrew Brayshaw, back on deck and in full training after his horrific season-ending broken jaw, and Ethan Hughes rounded out the top three at Cockburn on Wednesday. Logue and Blakely shape as crucial planks pushing the Dockers' rebuild forward in 2019 coming off injury-interrupted seasons. Logue's second AFL campaign was ruined by a congenital foot issue – which required surgery – and ankle trouble, with the athletic defender failing to add to the 13 games from his debut year. Blakely was sorely missed in the Dockers' topsy-turvy final nine matches this year after damaging the meniscus in his knee at training in June and going under the knife. Stationed mainly across half-back recently, the strong-bodied 22-year-old has been earmarked to fill the midfield void left since Doig medallist Lachie Neale's departure to Brisbane. An elite runner, Giro finished second behind new Giant Tommy Sheridan when Freo's full group ran a 2km time trial in January and the Norwood product was retained on the rookie list for next season after 10 appearances and three goals in his debut campaign. The remainder of Fremantle's playing group returns to training on Monday, November 19.